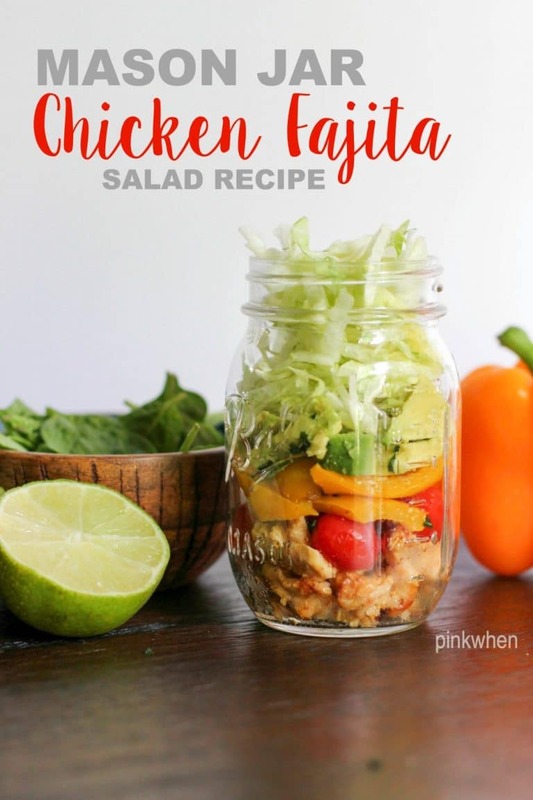 This Mason Jar Chicken Fajita Salad is so good, you might want to pack TWO jars to bring to lunch. I love a good salad, and this one is so good and so completely healthy. It’s filled with delicious, seasoned fajita meat, cherry tomatoes, bell peppers, avocado, green onion tops, a little cilantro, and topped with lettuce. Drizzle the top with your favorite healthy salad dressing, or eat plain. Either way, your taste buds and your waistline are going to thank you. One of the things I hated about packing a lunch to bring to work when I was younger was the fact that I was never really packing a healthy lunch. In fact, there were days where I would skip packing the lunch and just hit the drive thru. My arteries were probably not very happy with me, and I can assure you my pocket book wasn’t, either. The good news is that the older I got, the healthier I started to eat. I started to realize (like we all do!) that I only had one life to live and I better start eating better. It didn’t take long for my eating habits to change and I started feeling better. 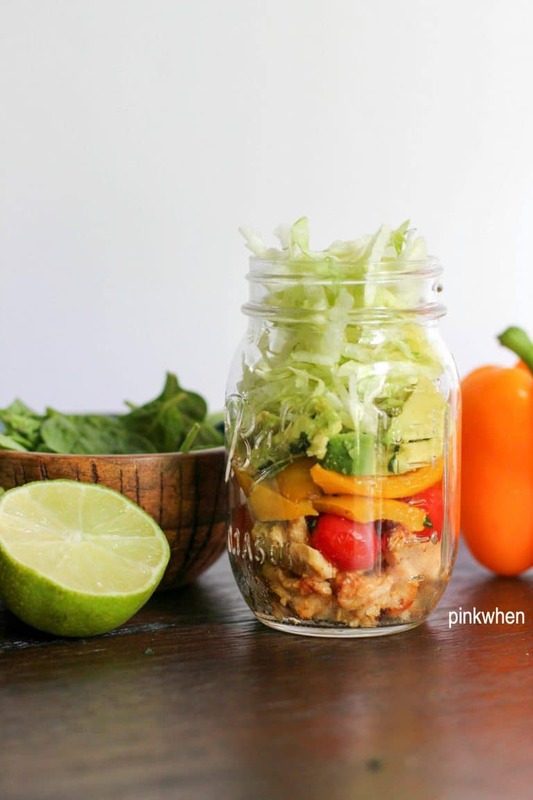 One of my favorite healthy lunch recipes is this Mason Jar Chicken Fajita Salad. It’s full of all of my favorite foods, and it is completely healthy! Here is what you will need to layer up and make this delicious salad. 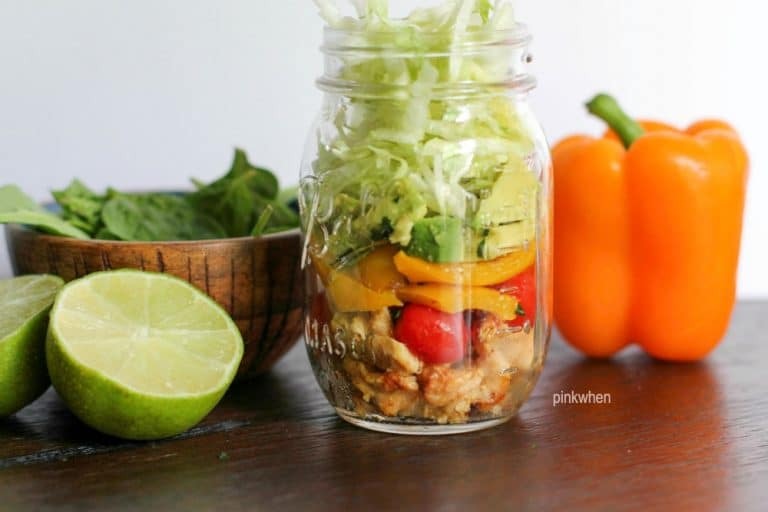 Layer your delicious mason jar with each of these ingredients as follows: fajita meat, tomatoes, bell peppers, avocado, green onion tops, shredded lettuce, and top with cilantro flakes. The only thing left to do is to drizzle with your favorite low fat salad dressing. I love this delicious salad, and hopefully it becomes one of your favorites as well. If you are looking for more healthy and delicious recipes like this one, you can find them under the Simple Fit Forty section here on the blog. If you want to join the community of ladies who want to stay fit and healthy, join our secret Facebook group.